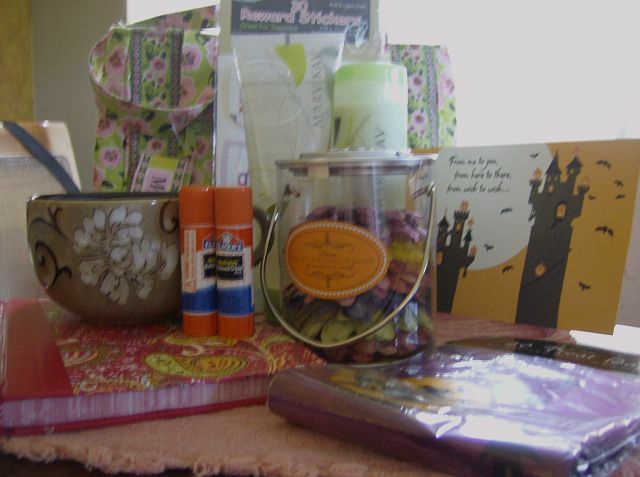 I participated in The Homeschool Post's September Swap, and here are the goodies my sweet swap sister sent. Sadly (how's that for alliteration? ), my camera, combined with my lack of photoography skills, means this picture doesn't do its contents justice. Her package arrived the day before my birthday, which made it even bigger the blessing. Andrea sent me a really nice, big, mug for my morning cuppa, as well as Mary Kay body wash and lotion - which smell wonderful! She sent a can of pretty flower embellishments that just might make a crafter of me, yet. Glue sticks - what homeschool doesn't use glue sticks? Some stickers for the kiddos, which you can't see 'cause there behind the blurry body gel. There's a cute little quilted MaggiB bag that will get a lot of use. Don't forget the journal and a bag of trick-or-treat goodie sacks to pass out Halloween candy to the little fairies and goblins that come each year. She really outdid herself - what a wonderful swap buddy. Not only is she generous, but she's patient, 'cause I was late getting my gift out to her. I hope she enjoys her box of goodies as much as I love mine. Head on over to the Post and get in on the October-November Swap! It's a lot of fun and, yaknow, it's just nice to get a package in the mail!